A whimsical fairy tale convenience store in Kokomo, IndianaBruce Katz at the Brookings Institution likes to talk about a paradigm called “cut to invest.” The idea is to cut spending on operations and lower priority items in order finance investments in higher priority infrastructure or other projects. Nice theory, but who is actually doing it? One example is Kokomo, Indiana. It’s not the mythical tropical island paradise you may have heard about from the Beach Boys. Instead it’s a small industrial city of around 57,000 people about 45 miles north of Indianapolis. After I posted a piece from Eric McAfee about Kokomo’s intelligent rail trail design, someone from the city reached out and invited me to come for a visit. So that’s what I did this week. 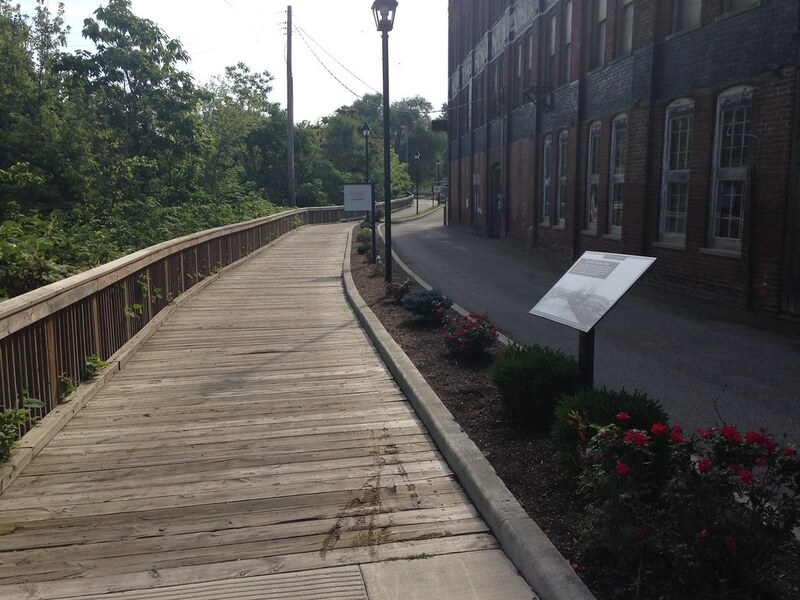 What I discovered is that Kokomo has done a lot more than just build a trail. They’ve deconverted every one way street downtown back to two way, removed every stop light and parking meter in the core of downtown, are building a mixed use downtown parking garage with a new YMCA across the street, inaugurated transit service with a free bus circulator, have a pretty extensive program of pedestrian friendly street treatments like bumpouts, as well as landscaping and beautification, a new baseball stadium under construction, a few apartment developments in the works, and even a more urban feel to its public housing. Like Eric, however, I wasn’t just struck by the projects themselves, but they obvious attention to detail that went into their design. And especially by the fact that they’ve done it almost all by paying cash – no debt – in a city that went through an economic wringer during the recession. A lot, though not all, of this has been pushed by Kokomo Mayor Greg Goodnight, who’s gone from factory worker to politician during his career. 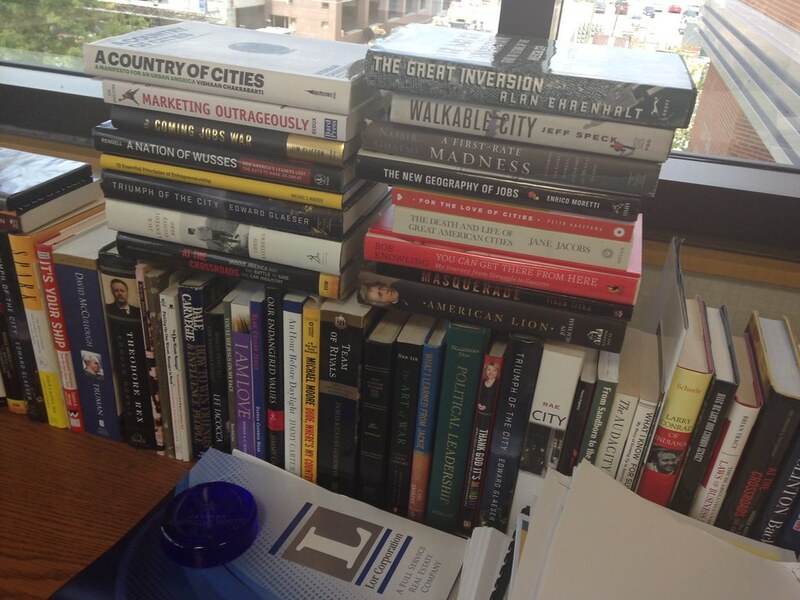 He also appears to be an urban planning geek, as the stack of books behind his desk shows. I sat down with the mayor and chatted about how the city pulled off this program of investment. After the jump I’ll visually walk you through a number of the projects. If the audio player doesn’t display for you, click over to Soundcloud. Pretty much every downtown intersection has a treatment like this, including landscaping. 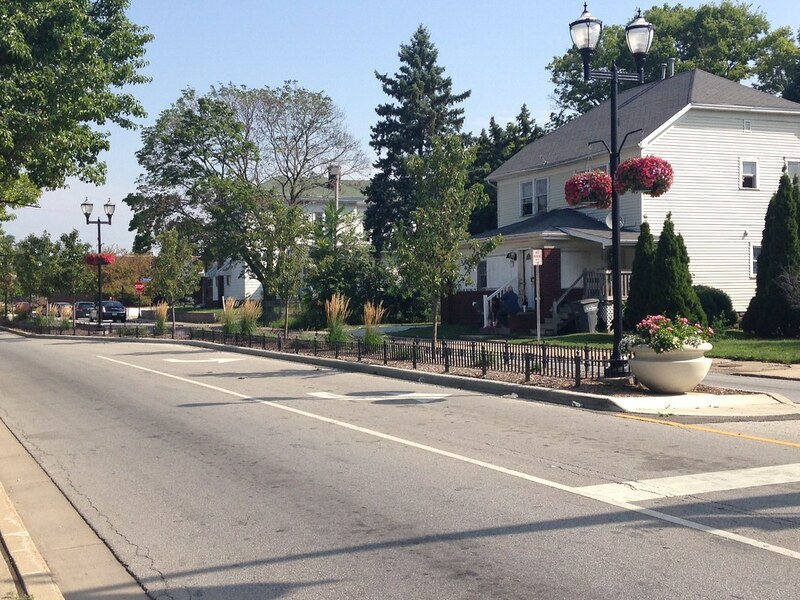 Taking a page from other cities’ playbook, Kokomo has invested in beautification, including not only landscaping of pedestrian bumpouts, but also hanging flower planters we’ll see later. These were actually put into place by Goodnight’s predecessor and were a huge source of controversy at the time, though seem to be well-accepted by now. Here’s another example on a street heading out of downtown. I’m actually of two minds about bumpouts. They do facilitate pedestrian crossings, but also can force bicyclists out of the curb lane into traffic. I’ve generally found them obnoxious when bicycling. The street widths through the bumpouts look ok here, but I didn’t put it to the test. A number of streets have painted bicycle lanes, where this is definitely not a problem. I think this is really attractive. 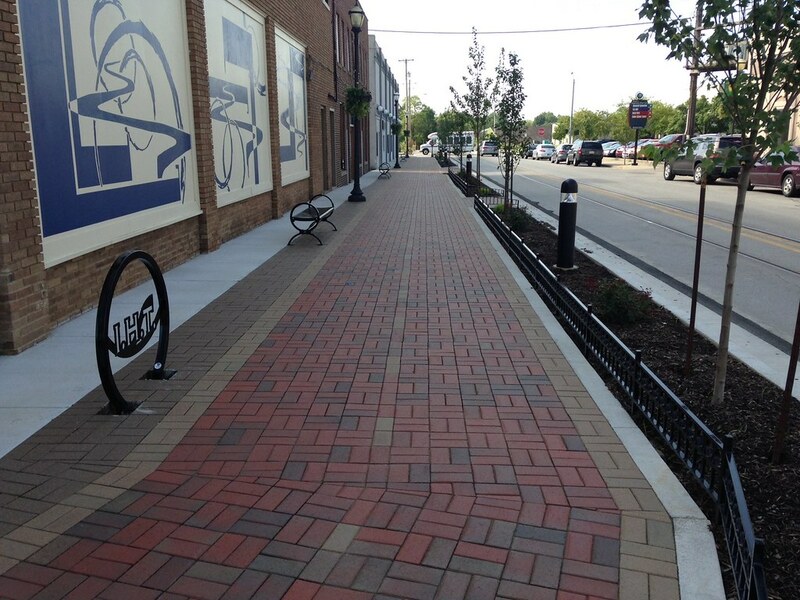 It reminds me of a red brick version of the Indy Cultural Trail. This section actually has a separate sidewalk from the biking trail, but that’s not the norm. Kokomo has really made a point to include some ped-bike protection wherever possible. So the landscape buffer is narrow, but effective and attractive. 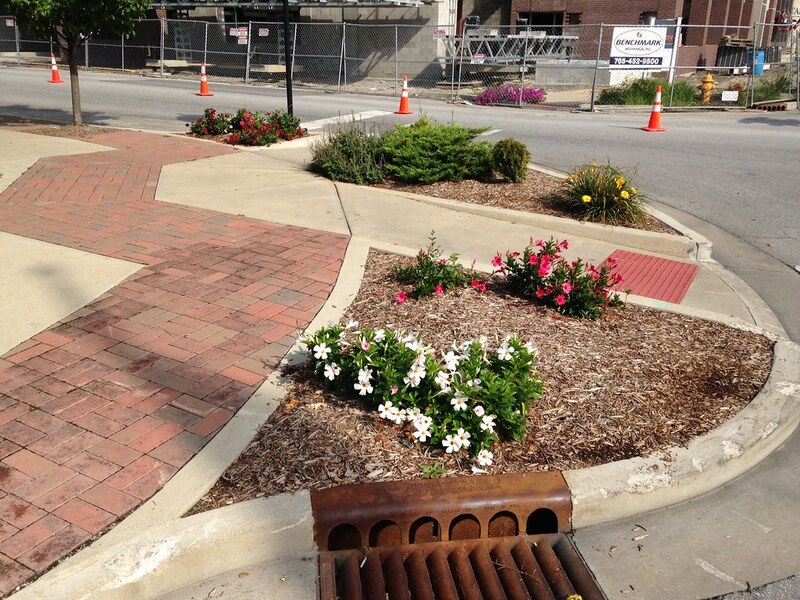 (It doesn’t use bioswale type green stormwater detention like the Indy Cultural Trail, though). There’s also ample street lighting and street furnishings. As one nice touch, note the back side of the stop sign. It’s black to match the color of the other items, not just plain galvanized steel. This treatment is done throughout downtown and adds a bit of refinement. Here’s another shot of a segment a bit south. Note the bespoke bike rack. There aren’t people in these photos, you might have noticed. I was doing this walking tour on a Tuesday morning, and it wasn’t super-crowded but I did see multiple people out biking and walking on these trails. Again, very attractive. And again, a narrow but nice buffer between the trail and the street, even though the roadway is little more than an alley or driveway. This is very consistently done, in another place even where the trail just passes through a parking lot. That’s what I mean by attention to detail. There’s a stream running to the left of the trail which adds to the pleasant effect of walking along it. The trail has its own traffic control signs, as well as a street sign near bicycling eye level to tell users what street they are at. In my experience, that’s too rare in trail design. You can also see bumpouts here along with large concrete planters that add beauty and make the crosswalk and street narrowing very visible to drivers. 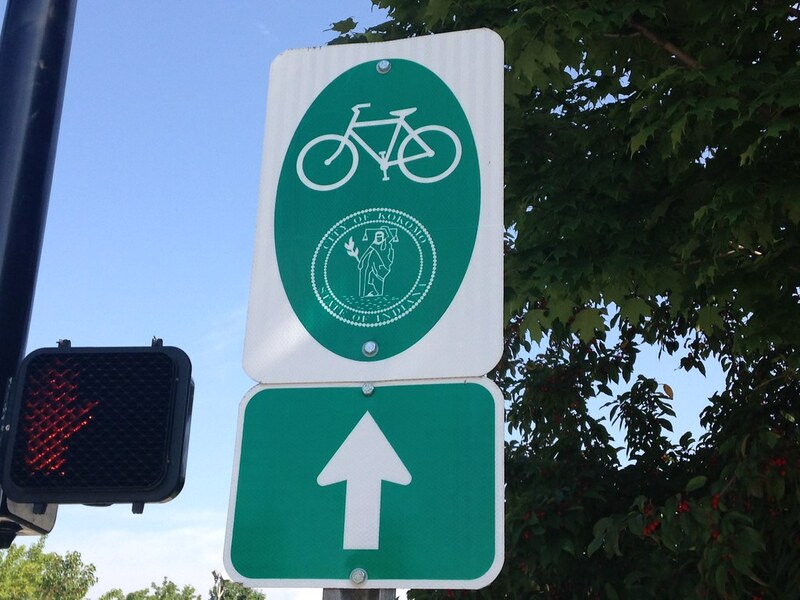 Here’s a bike route sign, with the city seal on it. That’s another nice touch and one that shows a certain pride of place versus a generic sign. Eric mentioned the school district’s International Baccalaureate program. But I don’t believe he mentioned that they also run an exchange student program. IIRC, students from 15 countries attend high school in Kokomo, and a number of them are actually housed in dormitories in downtown Kokomo. This injects life into downtown and creates a more international flavor in the city. I didn’t take pictures, but the school district is also renovating a 1914 vintage auditorium back to its original design that will be very cool (and also paid for without recourse to debt). Trails and bumpouts have a fairly limited cost, but the city is also doing some bigger ticket items including two recently-constructed fire stations, a million dollar renovation of city hall, a parking garage, and a baseball stadium. Pictures of those in a moment but it’s worth ask how the city was able to pay for them without debt. The first is that there was no legacy debt. I’m not anti-debt in all cases, but if a mature city like Kokomo is saddled with heavy debt repayments, that’s not good. By not having any legacy debt, the city’s tax base isn’t encumbered by repayments. A good part of our federal deficit these days is simply interest on our gargantuan debt load. That’s a dynamic Kokomo avoided. (The city does have some utility debt, but it’s revenue bond type stuff). Secondly, the mayor says that he was able to reduce the city’s workforce by close to 20%, going from 521 employees just before he took office to only 415 today. That’s a significant reduction, especially given the fact that during that time the city annexed seven square miles and added 11,000 new residents (though some of them were already receiving some city services). Some of this was achieved through efficiencies. For example, the city went to single side garbage pickup, where all garbage is collected on one side of the street, eliminating the need for trucks to traverse each street twice. The mayor, council members, and department heads have also had a pay freeze during that time, with at least some time in there in which all city employees had their pay frozen during the recession. Keep in mind, the city experienced a severe revenue crunch during the auto bankruptcies, and Chrysler, the town’s largest employer, failed to pay its tax bill. This created an urgent need for cuts. It’s possible the cuts and freezes have gone too far. I don’t know the full history of what has happened to services. But I speculate that having something like this can potentially act like a forest fire. It allows for longer term, healthier growth, whereas continuous growth in employees and compensation over time leads to serious fiscal problems. In any case, these reductions freed up cash flow as the city recovered, letting Kokomo allocate a decent chunk of its revenues to capital investment. This is running at about 5% of the overall budget, plus an additional sizable sum (for a city of that size) from an economic development tax. This is an example of the cut to invest strategy in action. 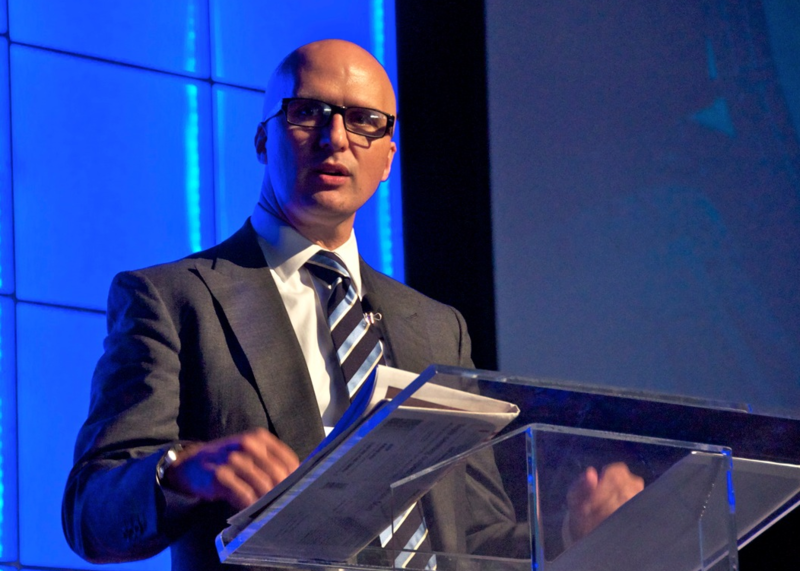 Without the cuts and tight budget management, there would be no money to invest. Indeed, some other Indiana community have found themselves asking questions like “what fire station should we close?” as they feel the sting of decline and tax caps. Here are a few more photos, then some additional observations. Here’s that parking garage I mentioned. (This was originally debt financed, but the city paid off the bonds early when it decided to borrow for the baseball stadium). This supposedly has some all day free parking, designed to attract downtown employees. There’s also going to be apartments on the top floor. It looks like there’s no ground floor retail, however, which will create a bit of a dead zone. 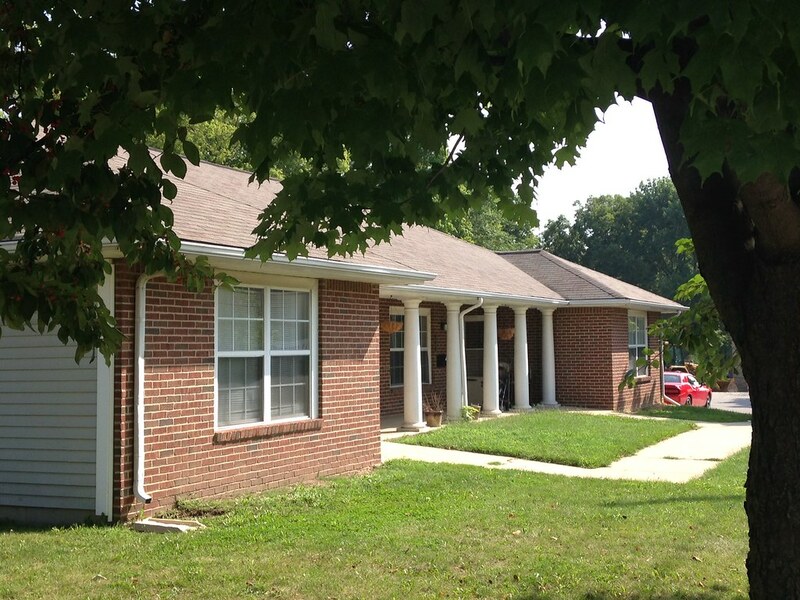 Here’s a picture of an older style public housing building. There’s nothing wrong with it, but it’s done in a traditional duplex style reminiscent of early suburbia. I think the fenestration is poor which gives the design a public housing look. Nevertheless, I appreciate that the city is even thinking about the design of public housing downtown as part of its strategy. After all, why shouldn’t public housing residents get to take advantage of high quality urbanism downtown like everyone else? Overall, I think they’ve done a number of good things, and I especially appreciate the attention to detail that went into them. You clearly get the feel of them walking downtown streets. I would say the commercial and residential development lags the infrastructure, however. That’s to be expected. They do have an Irish Pub, a coffee shop, a few restaurants, and other assorted downtown type of businesses. This will be an area to watch as some of these investments mature. When I talked to the mayor about this he took the long view, saying that Columbus, Indiana has been at its architecture program for decades, that Indy’s sports strategy is 40 years old, etc. Substantive change takes time. For example, Mayor Goodnight says it isn’t realistic to think that older workers who commute in to Kokomo will uproot themselves out of their established lives in other communities and relocate. But he’s more hopeful that as workers retire and are replaced, he’ll capture the “next generation” labor force. That’s obviously a more realistic ambition. But will an impatient public buy it? We’ll see. Clearly Goodnight has his critics. More than one of them has dubbed him the “King of Kokomo.” A newspaper article fretted about gentrification (level of realistic concern about that: zero). I didn’t do a deep dive into the other side, so keep that in mind reading this. But the baseball stadium would appear to be the most controversial item as near as I detect. Regardless of any controversy, when you look at the downward trajectory of most small Indiana industrial cities, the status quo is not viable option. Kokomo deserves a lot credit for trying something different. And regardless of any development payoffs, things like trails and safer and more welcoming streets are already paying a quality of life dividend to the people who live there right now. It’s an improvement anyone can experience today just by walking around. Historic buildings on Kokomo’s courthouse square. The tenants testify to the industrial heritage of the community. John, I think your puristic anti-car sentiments are way off base in this case. Kokomo isn’t Brooklyn or even Shadyside. It’s low density, auto-based city with a small downtown in which 99% of the people who come there have to visit by car. Would it be nice to reduce that ratio? Undoubtedly. But you can’t just wish it away and suggest you can eliminate the car and attract people or business there. Jane Jacobs talked about “attriting” car use. That is, slowly chipping away at it over time. Building quality alternative infrastructure is one part of that. But you’re not going to have a healthy downtown in these places by simply eliminating places or park or pricing it at a level for which there is no demand. And frankly, other than for downtown workers in these places, there’s extremely little demand today. I would take it further, Kokomo can’t have a remotely healthy downtown as long as 99% or even 70% drive to it. I is not a suburb and should stop trying to be one. Comments about how dead the downtown was till very recently show that no amount of surface parking has helped. The mayor’s own comment about residents confirms that. 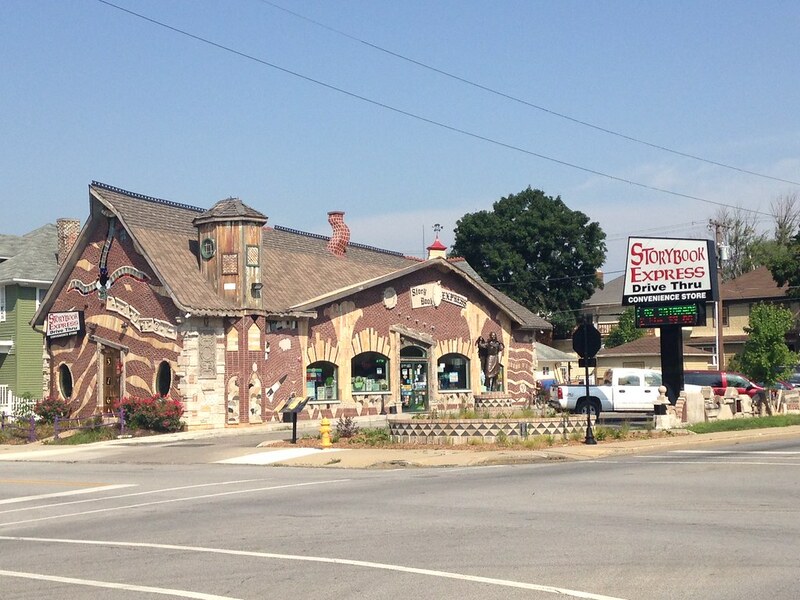 To correct the record, Kokomo was founded around 1880 and had a population of 30,067 by 1920. This means it could never have been a totally auto oriented city. It has also been bypassed by major highways leaving a much more in tact street grid than many regional cities. This should be seen as a huge asset. Oops, Kokomo already existed in the 1850’s and had a population of over 4,000 in 1880. I hope Aaron will try to research more and provide accurate context. John Morris, your last comments are a bit silly and do not support your argument. Most cities in the U.S. existed before automobiles became commonly used, including Los Angeles, Detroit, Indianapolis, etc. However, I do not think anyone would disagree that Los Angeles, Detroit or Indianapolis are auto-oriented cities (although this is slowly changing). Obviously, Aaron is referring to the modern development of Kokomo. Yes, in 1850 or 1880, the city was not auto-oriented (nor was Los Angeles, Detroit, or Indianapolis), but the city eventually became auto-oriented, as have many cities in the U.S. Posting snarky comments as you seem want to do, just makes you look immature and petty, and distracts from the substantive issues being discussed in these articles. In other words, grow up and try constructively contributing to the conversation. The peak population was reached in 1960 @ 47,197 with declines since until an annexation pushed the number up. What is pretty clear is that auto oriented policies did not work very well for the city. Almost all comments talk of a long decline. Aaron has not explained how continuing the same policies will result in improvement. He also misrepresented my views. I am willing to acknowledge that at this point some garage is needed but it doesn’t have to be on the main street and it doesn’t have to be a permanent structure. Why is a mayor concerned about budgets investing in a fixed structure when there are cheaper steel options? Are there any contributors with a knowledge of what Kokomo looked like pre 1930? What was there before the surface parking? I also linked to plans to facilities that will require still more parking. Even if a much larger one is needed the cost is probably a fraction of what they are spending. If this really is meant as a quick fix, until more residential is built this is the best option. 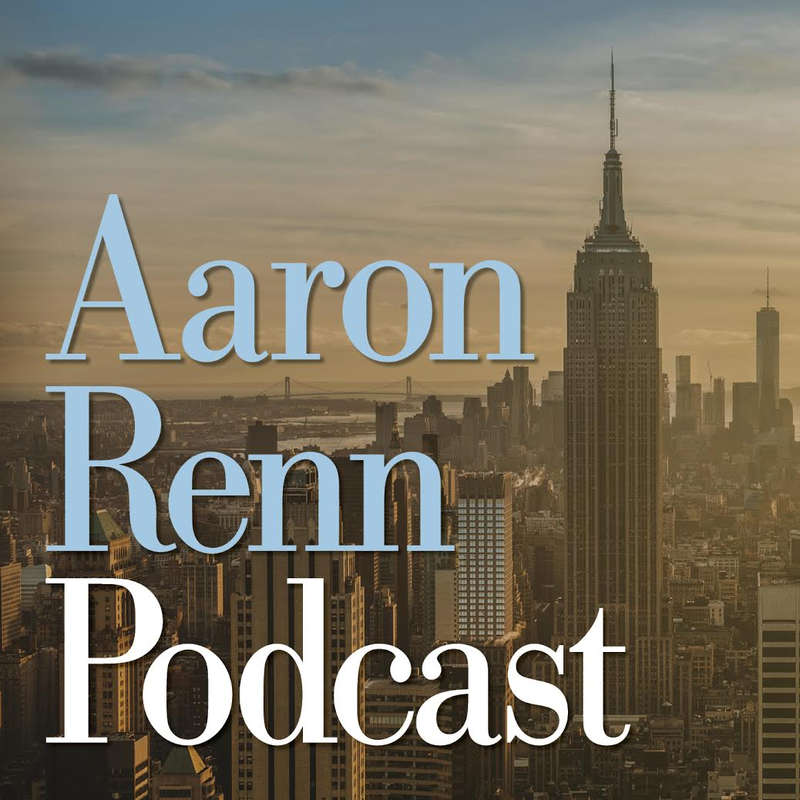 Aaron never brought up the issue of zoning, height limits or parking minimums in his interview. Each 3 space structure is sold by the piece. 300 cars = $260,000. 150 cars costs $130,000. This likely a fraction of what they are spending. But a structure like this says- temporary while many seem to see free parking as a right. As a long time resident I would say the biggest change here is the courage and vision to accept change. Gradually that has led to more confidence of the public and business community. Kokomo has progressive momentum and should be studied by other communities throughout the Midwest. I tend to agree- if pedestrian oriented projects are allowed and parking is not subsidized. The city seems to have an above average street grid and no in town highways. Not at all what one would expect in an “auto oriented city”. Most of the really effective projects like the First Friday events don’t actually cost much money. “Placemaking” is usually a very cheap strategy. 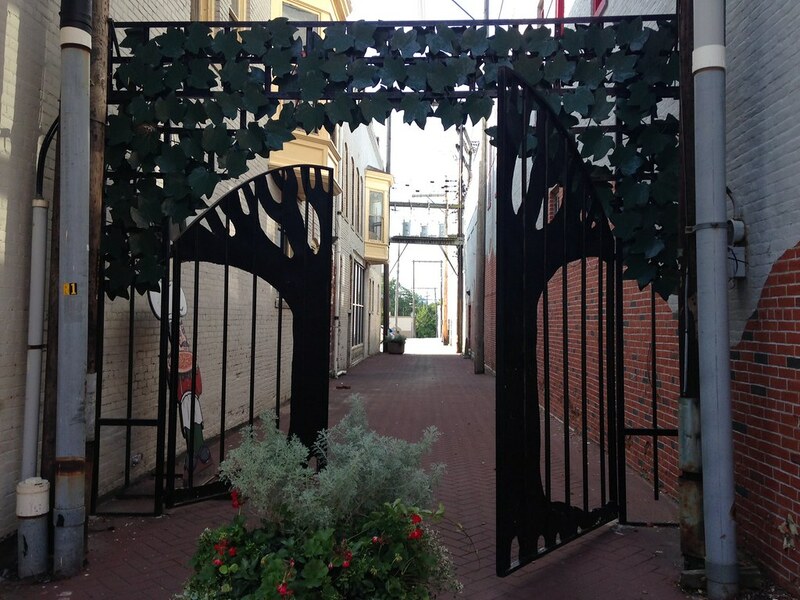 Has Kokomo tried having a green market downtown? What about other festivals that occupy the many surface parking areas? How does the college play into the downtown? I do think that John M has a point in that Midwestern downtowns struggle immensely because Midwestern cities are overwhelmingly geared to suburban modes. It’s tough for downtown to achieve critical mass with all of the dead zones the car culture necessitates. You’re fighting a losing battle that constantly requires drastic, expensive measures to maintain a degree of equilibrium. You need big plaza events, stadiums, and other costly incentives and subsidies to fake urban vitality. The model fails otherwise and is subsumed into the economics of the suburbs. I understand the logic behind the argument that we need to ween the Midwest off the car. But at some point, you have instances where you can’t have your cake (or car) and eat it too. We have to level with ourselves and admit that creating a true urban environment calls for drastic changes. Half measures are sometimes a waste of money and effort. From what I’ve seen in the Midwest, only Chicago works as an urban city (though it has immense problems), and Minneapolis/St. Paul as a “lite urban” experience. The rest are frauds. Exactly! Kokomo, should have learned this lesson from Indy, which is somehow always one project away from vitality. To a large extent, the mayor’s comments about residents and focus on placemaking shows he gets it. But, somehow towns can’t avoid slipping back into this trap. My guess is he is playing to a large audience that still doesn’t get it. One reason is that there is a massive industry of moochers that profit from the big project model. Yep. The answer to what it would take to revive Midwestern cities is simple. You need people to want to live urban lifestyles. Getting them to want to visit downtown for entertainment is, in reality, only a small part of the puzzle. But, of course, most Midwestern cities act like having a whizz-bang downtown is the whole puzzle. The truth is cities are largely powerless to convince people the urban living is worthwhile. That’s a decision you make on your own. How many people, honestly, sit back and think, “Well, I’d love to live in a big city, but there just aren’t enough parking garage, new stadiums, and ‘imaginariums’ downtown!” The stadiums and other vanity projects are last ditch efforts that are clearly poor investments, but are pushed because there is a lot of money to be made off the taxpayers. Kokomo could become the anti- Indianapolis, focusing on livable scale, creativity and affordability (low taxes). John, I’m afraid I do not understand. Besides students and people living in real urban cores like NYC what large group works/plays/eats/and lives in the confines of the same downtown. Kokomo’s population is less than 60K. The walkable area of the town are modest, even tiny. Even people who moved to an apartment in downtown Kokomo would have to commute to work, which might be anywhere in a 50 mile radius. Even if they are fortunate enough to work downtown, if they made a decent income would you really recommend that they do without a car? How would they travel to Indy or even the other half of their own town? What you are suggesting seems to be to create an artificial college town without the college. Can you point out where this is successful? I guess if Kokomo became an artist colony (since Artist do not have to travel to work, and like to keep costs down) this can work. However at current Kokomo is no artist colony. My sister who has been carless for most of 20 years living in East Coast Big Cities, finally broke down last week after living 7 months in LA and bought a car. If it is extremely difficult for an urbanite in LA, I don’t see how what you are proposing in practical for a town in the middle of Indiana. Everything starts small. Kokomo does have a college, IU, Kokomo with over 3000 undergrads, some in town employment and jobs not too far away in the surrounding area. San Francisco is off course the model for reverse commuting. Add in retired people. There is a very big difference between going completely carless and being car dependent. 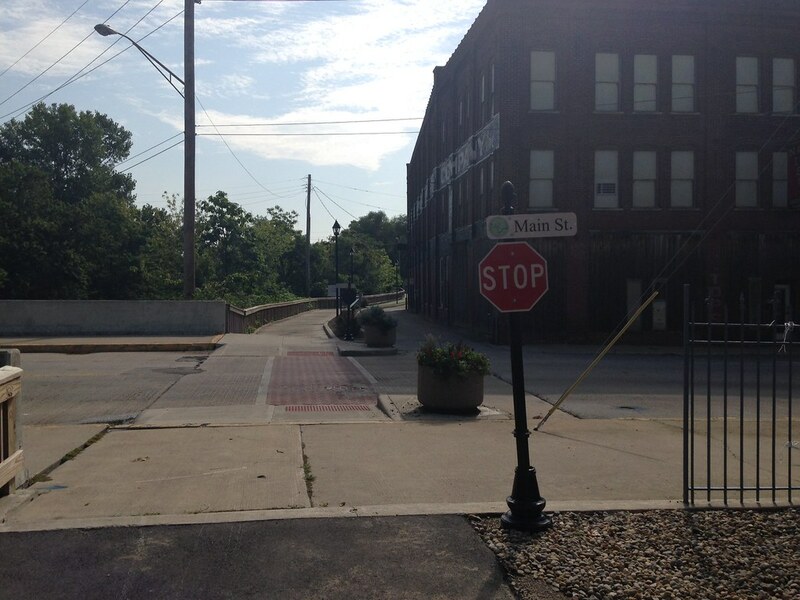 Kokomo does not seem to have the massive barriers to expanded walkability. Some streets may not have sidewalks- but they tend to have normal lengths and a normal grid. If you look at Google maps and zoom in, you will see that because of the downtown being a strictly business hub, parking is crucial. The courthouse, Dept. of Health, City Hall, Library, and YMCA are all businesses which attract drivers (and employees) from all over the county. The parking deck in question is set a block off-center, on Union Street behind the Irish pub. Its existence allows a second parking lot to be filled with a new YMCA (which seems to be one of Mr. Morrison’s wishes – a reduction in total parking lots). There are a lot of festivals held in the 8-10 square block area, which many of the businesses decry. A Farmer’s Market has been in full swing on Saturdays for years. The college is far south of the downtown, but there is a Middle School a couple of blocks south of the Police Dept. 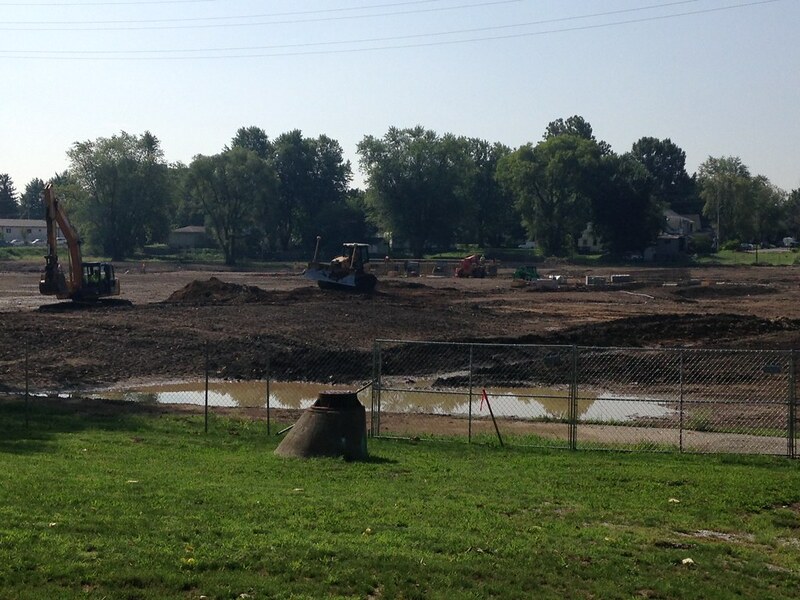 Incidentally, the flooded neighborhood which has been demolished is one block further south of the Middle School. It comprises 3 blocks and was maybe 3 dozen houses, not a very big “stadium” space. It’s really just a ballpark. That was the only “downtown” neighborhood which flooded. Don’t be fooled by news outlets which reported 200 homes damaged. They were not talking about “downtown” but about the whole city or even the whole county. The city is very auto oriented because residential, business, and shopping districts have been developed apart from each other, which is more a suburban landscape than urban. There is indeed a highway running through the city, just a mile or so from “downtown.” Its construction decades ago, plus the expansion along that corridor of automotive factories into huge campuses, propelled the town into its current sprawl. The article highlights the successful attempts of a small city to reverse the former blight of its business district. It is not a city attempting to turn a business district into a residential one. The historic record also seems to show that model has not worked very well. That is the issue here. Many, downtown business districts that never before had residents have them now- NYC, Philly, Pittsburgh, Cleveland, (Almost 15,000 residents now) Columbus, Cincinnati, Lowell Massachusetts. No amount of “free parking” and government subsidized attractions can fill the place of residents. I think several downtown apartment projects are already in the works. IU Kokomo now has more than 4,200 students. 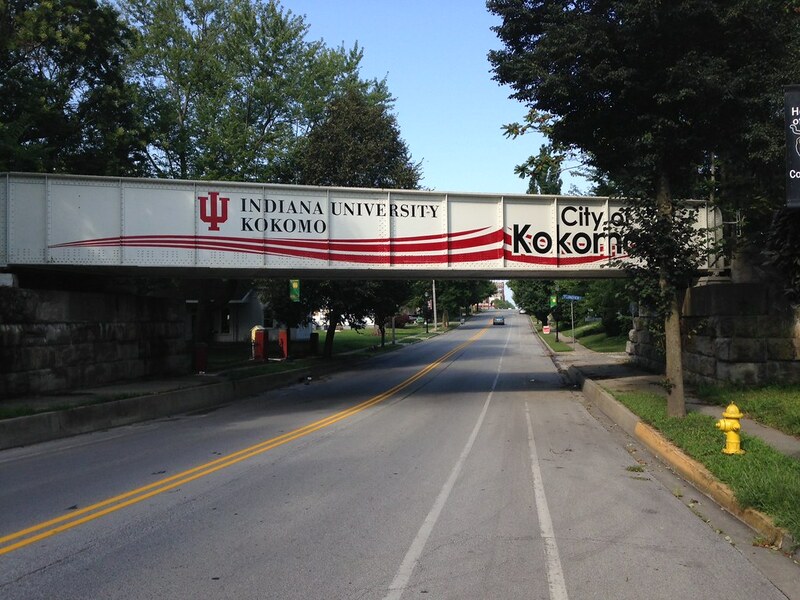 “Indiana University Kokomo hits the highest-ever student enrollment in its 68-year history, boasting a remarkable 12.3 percent increase over last year. Of the nearly 4,200 students registered, 74 percent of undergraduates are attending full time — another campus record. Most likely the town has a lot of latent apartment demand. @Lisa Kilmer’s description of the campus as far from downtown doesn’t ring true. The entire city is only 18.5 square miles. It is probably well within short bike, or shuttle bus range. suggestion:Either look at the map or visit, before you pontificate about a town’s choices. Very attractive, suggestions on where to stop in town rather than taking new bypass? Right, Kokomo’s previous north/south “highway” is really a stroad with multiple lights and turnoffs for factories, shopping etc. To the extent, the town had a highway, it has really been replaced by a bypass that goes completely around the town. Oh God. Coliseum Blvd in Fort Wayne…perfect example of a Stroad. Now looking pretty darn ragged. Along with the newer, posher Jefferson Blvd (Hwy 24 to the south). I will concede this sort of a highway- and sort of not. Pretty much the exact definition of a stroad. It’s a big stroad However, it is pretty much at the edge of town & the new highway avoids the town completely. For a so called “car oriented town” the job base seems amazingly compact. Most people seem to work at a few huge plants; in downtown, at hospitals, or the college. It may be that people drive almost everywhere, but the degree of current car dependency could probably be shifted. This doesn’t look like a very wealthy place where people have a lot off $ to waste on gas. A compact, nice, mixed use downtown with a large dose of residents might be strongly embraced. Aaron, thanks for the update regarding Kokomo. Removing the one-way pairs is especially interesting, as many Midwest downtowns struggle with addressing this problem. My understanding is that undoing them is expensive and involves a lot of political brain damage. So they remain a development annoyance in many communities. If any Urbanophiles have seen any studies regarding the value of their removable, I’d love to hear about it. It is my understanding that in Vancouver, WA, the city moved from one- to two-way streets without traffic studies or new equipment, and saw a significant and immediate increase in downtown sales. In many places, the change-over may not be nearly as difficult and expensive as supposed. Carl, I think one of the issues with deconversion is stoplight replacement. You need two-direction stoplights, which can be an expense. But removing all the stoplights, that expense was avoided and it actually saved ongoing money too. Please, has Indy not changed because of the expense of stoplight replacement? Not saying this can’t be a marginal factor, but the main issue is courage. 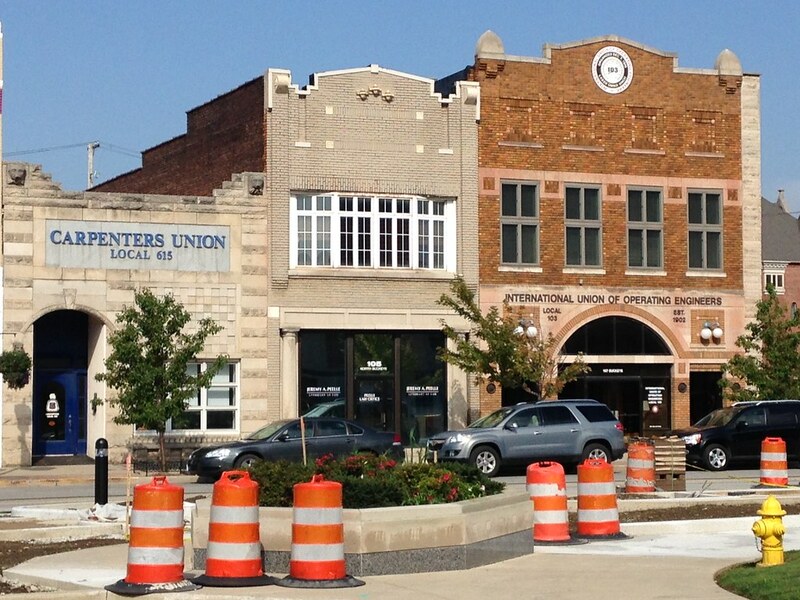 Nice piece about Kokomo and its efforts at revitalization. I have noticed a trend in smaller cities to use streetscape as a major reinvestment tool, probably because of available transportation dollars. This is also something where the city owns the right of way and can take a unilateral action. Figuring out what level of streetscape improvements gets the best return on investments is a topic worth investigating. 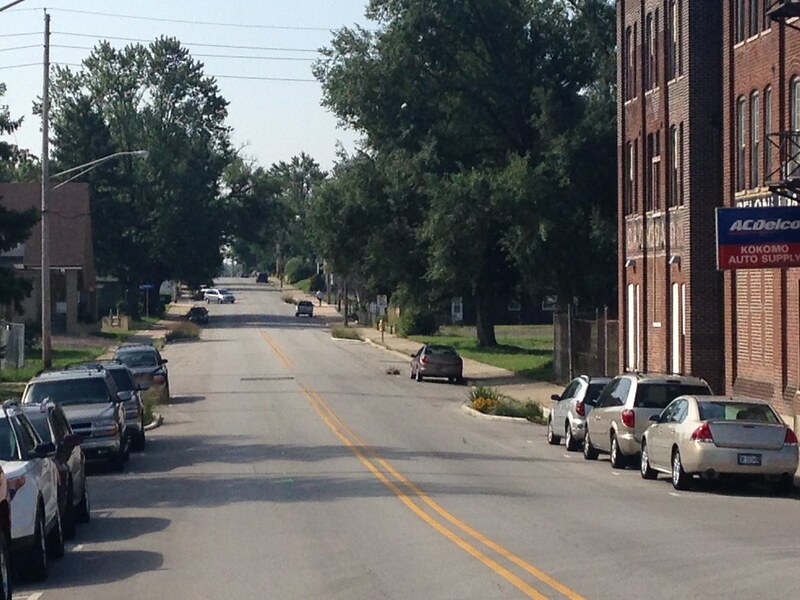 Kokomo seems on the right track with the bicycle addiction but is still car dependent. Cities like Evansville IN created a hugely expensive downtown streetscape that appears to have added little benefit. Bump out at every corner don’t really do much, and they seem to be everywhere. Springfield IL took one major downtown street and removed all the parking with expensive “hardscape” that is particularly ineffective. 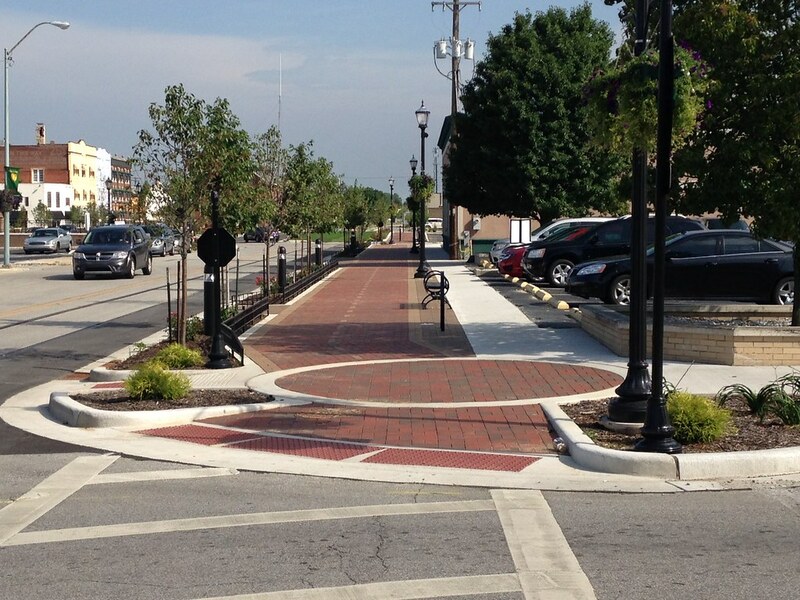 Batavia IL recently created a European “complete street” with lots of expensive brick paving and a $ 100,000 welcome arch. 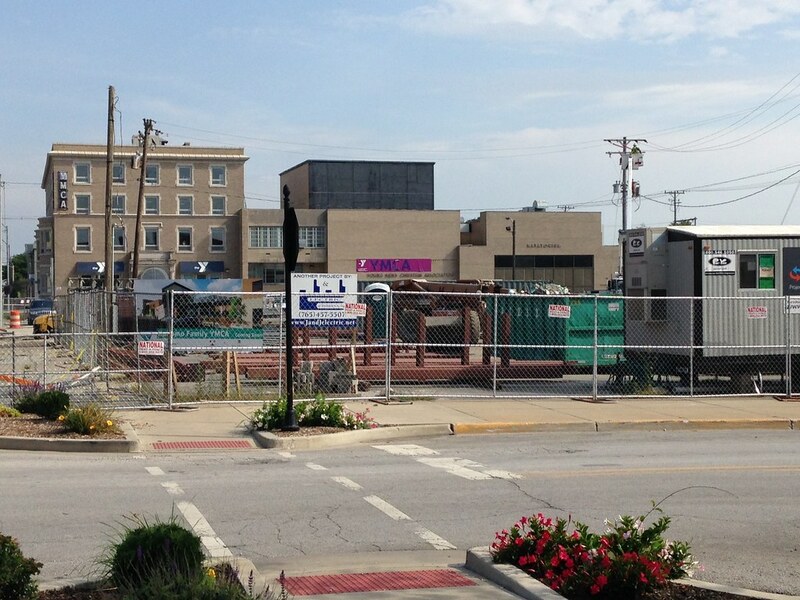 I don’t think any single improvement can “fix a city.” Kokomo has some aspects of an older street grid form going for it, but a wholistic city wide transformation has to happen. Bike lanes, the free circulator, reverting to two way streets, & events are a big part of this. Zoning, reducing or eliminating parking minimums & height limits are also critical- and not just in the downtown. Very interesting and informative article, with many insights. A comment in the article- “Regardless of any controversy, when you look at the downward trajectory of most small Indiana industrial cities, the status quo is not viable option” is very important, given the continuing economic turbulence and changing demographics.In addition, the Mayor’s leadership and the collaboration of the Town Council is another key ingredient as the town continues to move forward. Aaron, Rod Stevens — thanks for the insights. Mike Jackson hits on key points about why / how streetscape enhancement occur. From an image standpoint, I think they are essential. I can’t think of a single thriving Chicago or Chicago metro commercial district that has not had a significant streetscape enhancement. Curb appeal matters not only to home buyer but also to commercial district investors. The cost of these improvements range in a continuum from basic cleanup type stuff to “signature,” destination quality type of enhancements. That said, streetscape enhancements alone do not guarantee success. There are many other factors that contribute to a commercial district’s vitality. For example, property owner status and local economic redevelopment economics are issues that are often overlooked or poorly understood. If there is a critical mass of property owners with unreasonable expectations in a struggling business district, or if a community targets projects that are economically not feasible, redevelopment can be inhibited for years and even decades. But back to the original issue. Municipalities — the public — own and are responsible for 25% — 40% of city’s physical space. If a city is not motivated to invest in the public space they own and control, why should they expect the private sector to be interested? Streetscapes should be part of a larger strategy that tips private investment, focusing these public investments in a smaller area to ensure results. Those other measures might include facade grants, community policing, restoration of an anchor user (such as the historic theater in Fargo, ND), or eating areas for a food pod. Better guaranteed success than spreading the peanut butter too thin. The design aesthetics are simply enchanting, very humanizing. I live in Kokomo, work at a hospital, and my wife works at IUK. Having moved back here from bus-friendly Bloomington (IU’s much larger and different main campus), it is hard being a one-car family. We have a high school senior at home who just turned 18 and works too. So three adults who juggle one car, rides from coworkers and classmates, minivan taxi cabs, and a trolley bus that comes within ten blocks of our rental home once an hour (two blocks if we want to ride in the wrong direction). Crossing Markland on foot to catch the trolley westbound is not safe. The trails are a huge improvement from the decaying steel-mill town I remember as a kid, but the trails stop before reaching the hospitals or IUK. We have bridged those gaps on foot and on bicycle, but doing so requires walking a roadside with no sidewalk, and being next to traffic that blows down Lafountain with no respect to pedestrians. Off the trails, anyone on bike or foot is presumed to be a DUI offender with a revoked driver’s license. Mopeds are called DUI scooters, and there is a stigma with bus transport that I don’t feel when I visit Bloomington and Chicago, where public transit is the norm. IMO, IUK is not accessible from downtown on foot or bike. 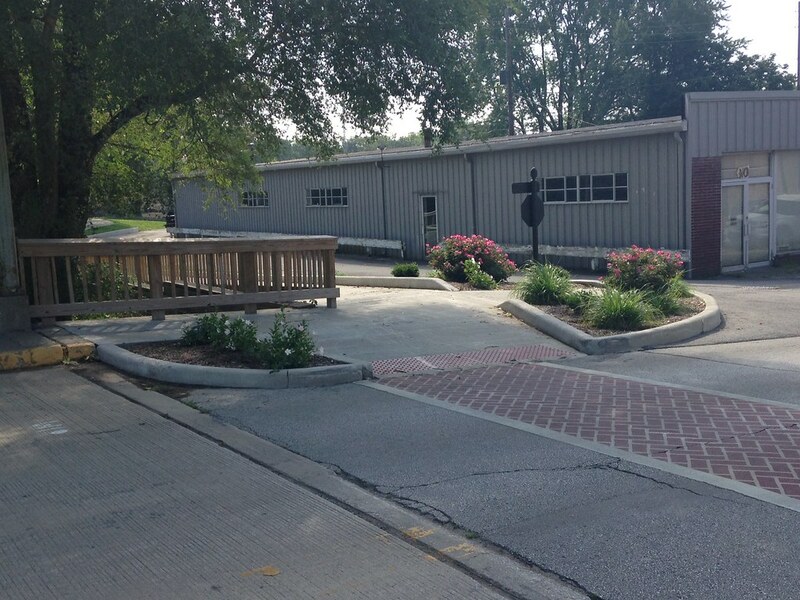 Ivy Tech is even worse situated, requiring one to cross the old 31 “sproad” (good desc, btw). We don’t live downtown, and since I work nights, usually miss out on Farmers Markets and First Fridays. But I am glad they are there, along with a growing emphasis on festivals and concerts in Foster Park. To me, events are the draw. If nothing is going on downtown, I don’t usually visit. When I do get a day off, I sometimes visit Comics Cubed or Pepperwhistle Cafe, but that’s about it. I’m sharing these concerns because it is a good article with an excellent discussion. 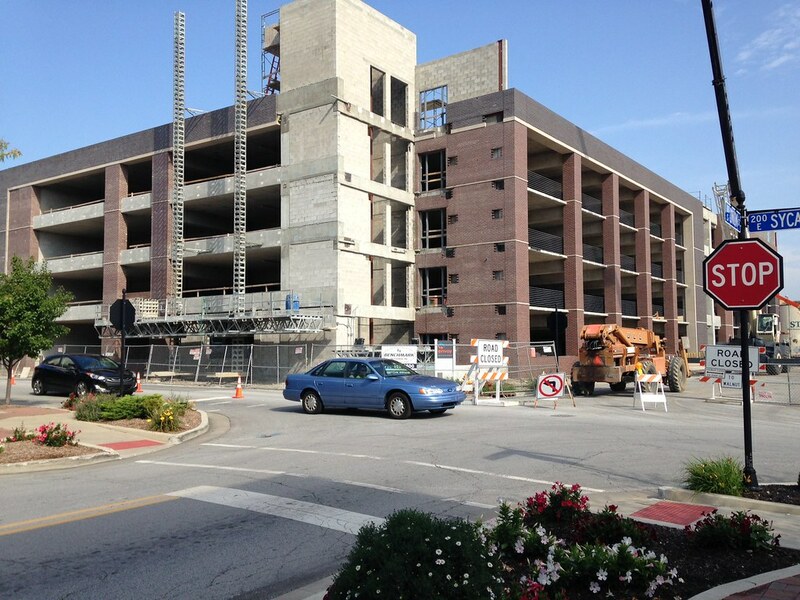 Overall, I think Kokomo is in its best period of growth to date. 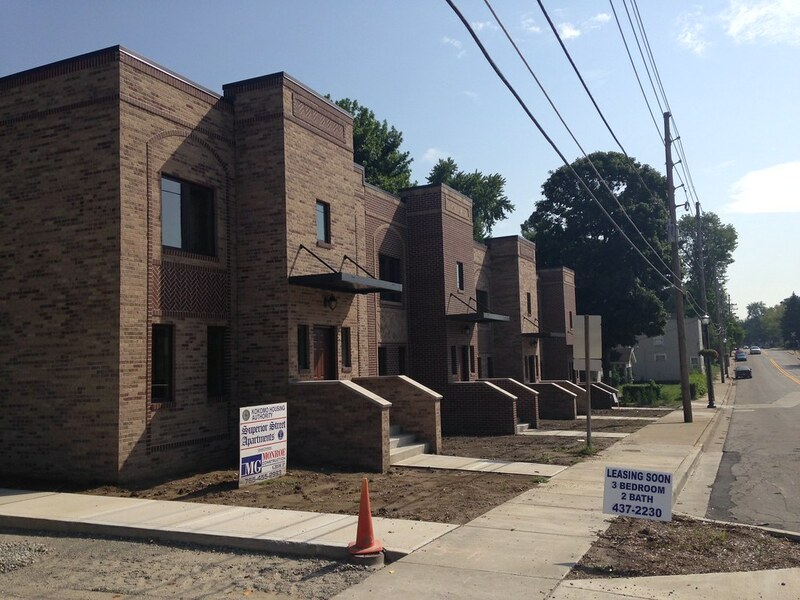 There is a long way to go, but returning residents like us are definitely noticing before-and-after progress.